I organized the rest of the books by color groups and then by size. I tried each stack vertically and horizontally and settled on what worked best. There were enough books that in order for the shelf to not looked cluttered, I decided to split the books between the shelf and the unused top of the bookcase. 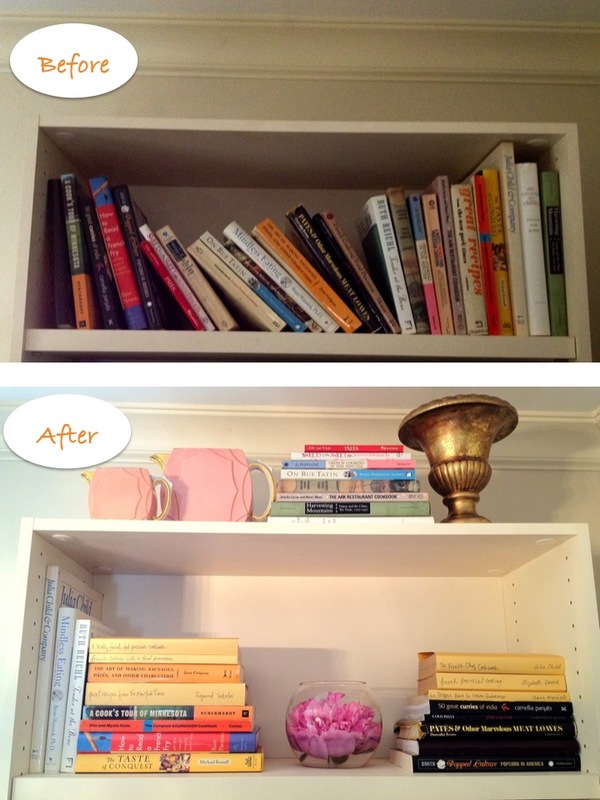 It’s a very small thing, but I much prefer gazing up at the “After” shelf than the “Before” version! This entry was posted in Before and After and tagged Before and After, Czechoslovakian vintage, HGTV, home décor projects, home projects, interiors stylists, occasional sale purchase, occasional sales, Paris flea market, reorganizing a bookshelf, The Cottage House, The Cottage House Minneapolis. Bookmark the permalink.